Plenty games on smartphone are developed from television series. 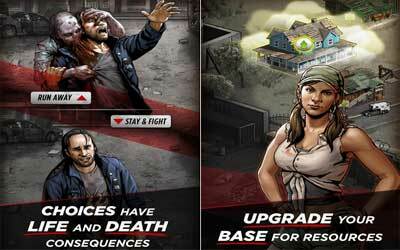 One of those games is Walking Dead: Road to Survival APK 2.7.36670 developed by Scopely. Walking Dead itself is a famous television series adapted from the comic version. The story line of this strategy game is stay true to the comic version. Therefore, you do not need to be surprised to find out that your favorite character, Daryl Dixon, is not available in this game. For those who do not know Daryl is exclusive character in the Walking Dead television series. The plot of Walking Dead story begins when Philip “the governor” takes over the Woodbury and attack the survivor base lead by Rick. The battle system of this survival game is relatively simple. The player gets one attack opportunity in every turn. In order to get the maximum damage point to the enemy, you need to upgrade the skill and weapon of your character. The character of the game are called the survivors. Meanwhile, the zombie enemies are called the walkers. Attacking walkers are easy, especially since they move so slowly. However, there are also human enemies called the raiders. Since they have the same ability as the survivors, some of them might be more difficult to defeat. The most notable thing about the story is that the options you choose affect the whole story. For example, there is a time when you have to decide whether you in the governor or Rick side. The option to kill or save your partner life is also crucial to the plot of the story. Therefore, the story of Walking Dead: Road to Survival for Android that you play might be different with the one played by other player. Other feature that you can enjoy from this game is building the survival base. This base is important to heal the injury survivor or to train their ability. Prestige System – Earn Prestige Points each day and from purchasing coins to rank up and unlock perks, exclusive characters, and weapons! Stage Ranking & Salvage Tokens – Earn three stars on a stage by surviving with your team intact to unlock Salvage Tokens that instantly collect a stage’s loot!